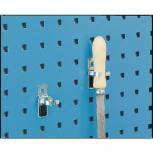 VFM Perfo System Single Tool Hook 50mm (Pack of 5) 306965 Pack of 1 Single tool hooks for use with the Perfo tool storage system. Single tool hook. Length - 50mm. Non returnable. 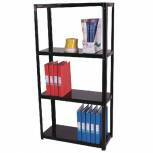 Storage Solutions Light Duty Boltless 3-Shelf Unit Black ZZLS3BK078B07030 Pack of 1 Storage Solutions light duty 3 shelf boltless shelving unit with fixed shelves. Suitable for home and office use and accepts A4 files only. 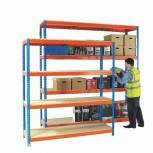 Shelves accept up to 55kg in weight. Dimensions: H760 x W700 x D300mm. Colour: Black. Non returnable. 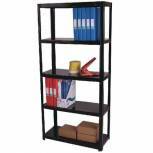 Storage Solutions Light Duty Boltless 5-Shelf Unit Black ZZLS5BK150B07030 Pack of 1 Storage Solutions light duty 5 shelf boltless shelving unit with fixed shelves. Suitable for home and office use and accepts A4 files only. Shelves accept up to 55kg in weight. Dimensions: H1500 x W700 x D300mm. Colour: Black. Non returnable. 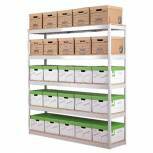 Zamba Stock Archiving Shelving W1500mm Grey STS834556 Pack of 1 Ideal for the storage of standard sized archive boxes, documents and for all general storage or stock storage requirements. Non-Returnable. 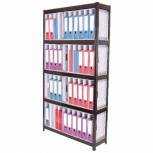 Storage Solutions Boltless 4-Shelf Unit Black STS56037 Pack of 1 Cost effective solution for your archive needs.Ideal for standard sized archive boxes. Non returnable. 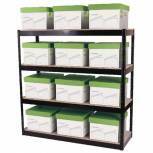 Storage Solutions Boltless 5-Shelf Lever Arch File Unit Black STS834450 Pack of 1 Lever Arch Shelving. 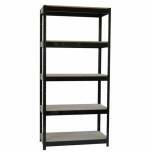 Steel framed, height adjustable shelving with a black powder coated finish, ideal for offices, store rooms and warehouses. 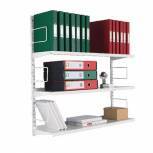 Supplied with five wooden shelves accommodating up to 40 Foolscap Lever Arch Files. Non returnable. Storage Solutions 3-Tier Wall Mounted Shelf Starter ZZTS4WH100T10027 Pack of 1 Wall Mounted Twin slot Shelving Starter Set. Each set comprises of two 1000mm uprights, three shelves W1000 x D270mm, six brackets D270mm and six spring Rod Book Ends. Fixing kit not included. Colour - White. Non returnable. 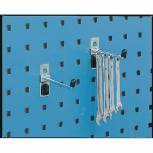 VFM Perfo System Single Tool Hook 25mm (Pack of 5) 306967 Pack of 1 Single tool hooks for use with the Perfo tool storage system. Single tool hook. Length - 25mm. Non returnable. 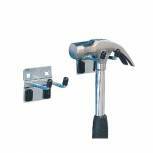 VFM Perfo System Single Tool Hook 100mm (Pack of 5) 306968 Pack of 1 Single tool hooks for use with the Perfo tool storage system. Single tool hook. Length - 100mm. Non returnable. VFM 50mm Double Took Hook For Perfco System (Pack of 5) 306972 Pack of 1 Double tool hooks for use with the Perfo tool storage system. Single tool hook. Length - 50mm. Non returnable. 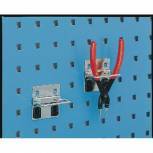 VFM Perfo Plier Holder Hooks 55mm (Pack of 5) 306978 Pack of 1 Plier hooks for use with the Perfo tool storage system. Single tool hook. Width - 55mm. Non returnable. 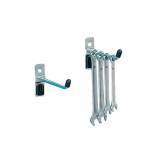 VFM Perfo System 19mm Spring Clip (Pack of 5) 306987 Pack of 1 For use with the Perfo Tool Storage System. Helps prevent tool loss or damage. Provides easy access to items. Zinc finish. Supplied in a pack of 5. Diameter: 19mm. Non returnable. 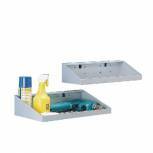 Perfo System Grey Tool 450X170mm Shelf 306993 Pack of 1 For use with the Perfo Tool Storage System. Perfect for holding tools, parts etc. Easy way to keep working surface clear. Colour: grey. Dimensions: 450x170mm (WxD). Non returnable. Bracket Pipe 60x100mm (Pack of 2) Grey 306999 Pack of 1 Discreet grey pipe bracket. Holds pipes securely and with ease. Works with the Perfo tool storage system. Simple to fit and move. Colour: Grey. Supplied in a pack of 2. Diameter 60mm, width 100mm. Non returnable. 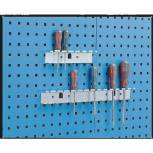 Screwdriver Unit 225mm Long Zinc 307004 Pack of 1 Screwdriver unit for tool storage. Suitable for use with the Perfo Tools Storage System. Prevents loss of your tools. Zinc finish. Width: 225mm. Non returnable. 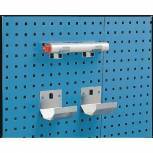 Heavy Duty Painted Additional Shelf 1800x450mm Orange/Zinc 378856 Pack of 1 Extra chipboard shelf to suit heavy duty boltless shelving. Maximum shelf weight capacity: 600kg. Dimensions: W1800 x D450mm. Non returnable. 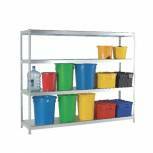 Heavy Duty Galvanised Additional Shelf 1800x450mm Orange/Zinc 378876 Pack of 1 Extra shelf for the heavy duty galvanised shelving. 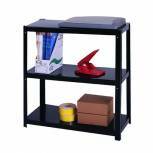 Max shelf weight capacity: 600kg. Dimensions: W1800 x D450mm. Non returnable.